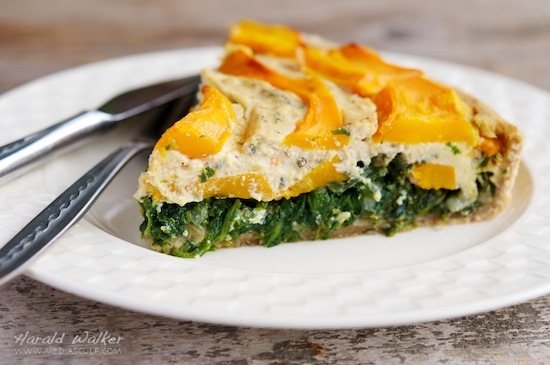 This is a very hearty and filling quiche. It is quite tasty and pretty to look at as well. It would make a nice holiday brunch or a good supper meal. Begin by roasting the butternut squash or pumpkin. 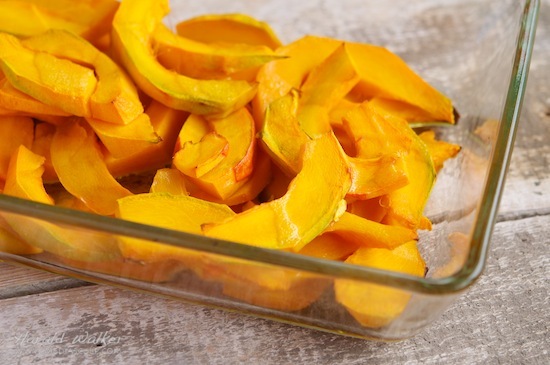 Cut the squash or pumpkin, remove the skin and the seeds and slice in 1/4 in slices. 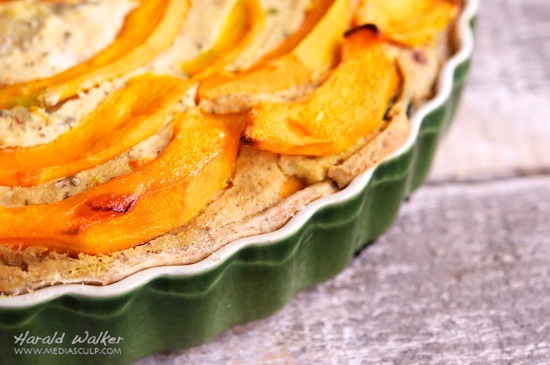 Place in an oven-proof baking dish, sprinkle 1 tablespoon of olive oil over and mix. Bake for 20-30 minutes or until fork tender. Meanwhile, also thaw the spinach. Place the flours and salt in a food processor. Add the vegan margarine pieces and pulse to for a coarse grainy mixture. Add 4 tablespoons of cold water and pulse again to form a ball of dough. If the dough is still crumbly add 1 more tablespoon of cold water and pulse. Continue until the dough is a solid ball. Remove from the food processor, wrap in plastic wrap and chill for 1/2 hour. 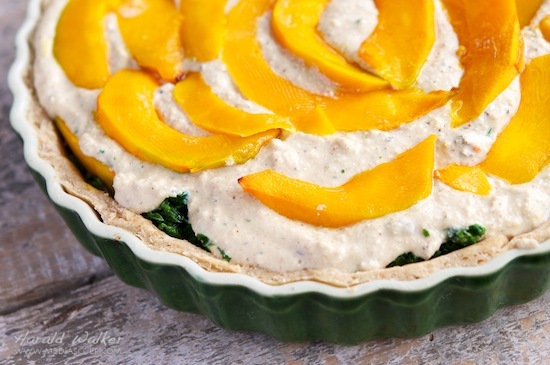 When dough is chilled, roll out to fit tart pan and chill for an additional 30 minutes. Crumble the tofu into a blender or food processor. Add the rest of the quiche ingredients and blend to a smooth mixture. Taste the mixture and season to taste as needed. Lightly saute the chopped onion in the other 1 tablespoon of olive oil. Mix the onion with the thawed, drained spinach. 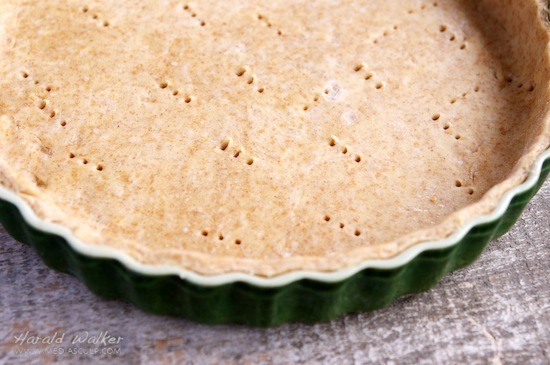 Prick the dough in the bottom of the tart form overall with a fork, to prevent the dough from swelling or rising. Place the spinach onion mixture as the bottom layer of the quiche. 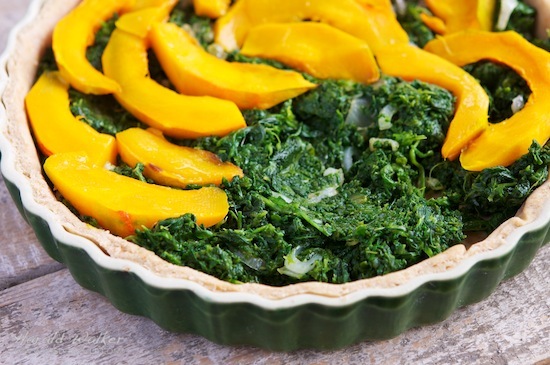 Place a thin layer of roasted squash on the spinach and pour the quiche mixture over the top. Add 1 more layer of roasted squash on the top. Bake in the oven for 50 minutes or until the crust is golden brown and the filling is firm. Remove from the oven and allow to cool and set for 8-10 minutes. Posted by Chris Walker on March 21, 2012 in Main Dishes, Pumpkin, Spinach, Tofu.